Our latest paper was published yesterday in Cell Reports. In this article we described the turnover rate of microglia in the mouse and human brain. 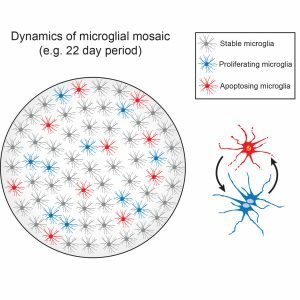 We observed that microglia turnover faster than expected, thanks to the temporal and spatial coupling of proliferation and apoptosis. We are very excited about these new results and hope will help understanding a bit better the clockwork of these amazing cells! Thanks to all the people involved in the study and special congrats to Katie, as this is her first paper as first author! Previous Post:New photos in the gallery!